To aim high sometimes pays dividends. Ethiopia were busy planning how to qualify for their first ever World Cup in 2014. Now they are celebrating a return to the Africa Cup of Nations after a wait of three decades. The Waliya Antelopes are top of Group A in the African zone of World Cup qualifiers, but reaching the 2013 Nations Cup in South Africa marks a new dawn for the country. The Ethiopians beat Sudan 2-0 in Addis Ababa last Sunday to qualify for their first continental finals since 1982 on the away goals rule, after the tie had ended 5-5 on aggregate. If the celebrations in Meskel Square in the heart of Addis Ababa were anything to go by, then it is clear that 85 million Ethiopians are ready to reclaim their lost heritage as one of the pioneers of the African game when they play in their 10th finals since 1957. "We've made it due to the hard work and unity in the squad," coach Sewnet Bishaw told BBC Sport. "We trained very well and the players were highly disciplined. This has helped us to be successful. "I was always confident. We made silly mistakes in Sudan and also, due to some refereeing errors, gifted them with two late penalties, but I always knew we could make it." Amid the celebration, some Ethiopians would be forgiven for forgetting that their national team are former African champions. More than half of the current population was not yet born when the Antelopes won the Nations Cup in 1962. Fifty years ago, they were among the most feared sides on the continent, playing in the first seven Nations Cup tournaments, beating sides like Ivory Coast, Tunisia and Algeria without much effort. That dominance, which produced the likes of Menguistou Worku, Luciano and Vitalo Vassalo, may now have been revived. In June, they drew 1-1 away with South Africa, after taking the lead in a World Cup qualifier. That performance caused Ethiopian fans to sit up, put aside their obsession with the big European leagues and take notice of the national team once again. 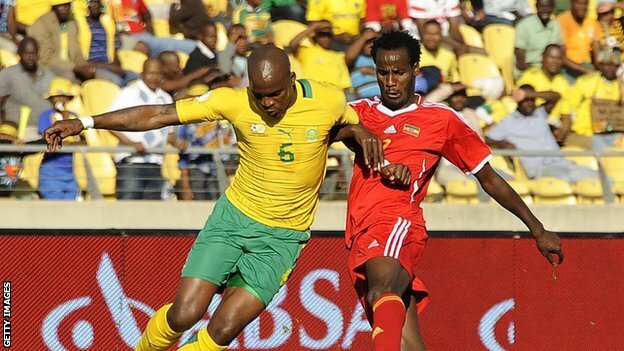 Bishaw believes that qualification for South Africa will change the attitudes of the country's footballing community. "Everybody is happy after this qualification," he said. "Clubs will now start to focus on youth football. This will spread to every corner of the country and football will bring everybody together." Ethiopia's short passing game, combined with individual flair and self-conviction, is the cocktail concocted by coach Bishaw. His largely home-based side is now endowed with tremendous self-belief, not least the previously shaky but now ever-reliable goalkeeper Sisay Banchabasa. Saladin Sahid, who scored the vital second goal against Sudan, is the only member of the side who plays outside Ethiopia - for the Egyptian Premier League side Wadi Degla. His goals have made him a household name. According to the Ethiopian calendar, 11 September 2012 was New Year's Day welcoming 2005. The previous year had ended dramatically with the double mourning of the former Prime Minister Meles Zenawi and the Patriarch of the Orthodox Church, Pope Abun Paulos, both of whom passed away within days of each other. But the Antelopes and their fans can now find consolation, as their New Year has begun with one of Ethiopia's biggest successes in half a century.